Hubble Space Telescope images offers an unprecedented view of a planetary game of Pac-Man among three red spots clustered together in Jupiter's atmosphere. 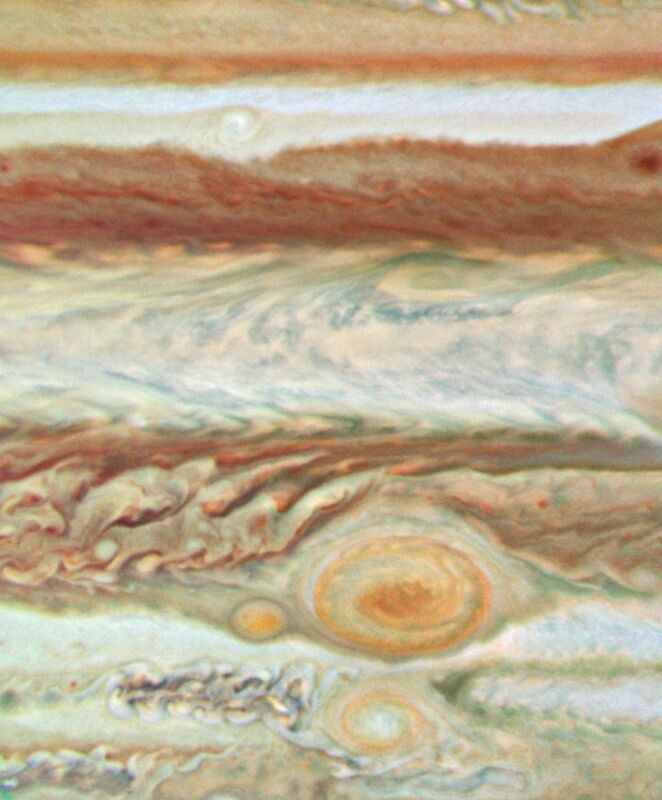 The time series shows the passage of the "Red Spot Jr." in a band of clouds below (south) of the Great Red Spot (GRS). "Red Spot Jr." first appeared on Jupiter in early 2006 when a previously white storm turned red. This is the second time, since turning red, it has skirted past its big brother apparently unscathed. But this is not the fate of "baby red spot," which is in the same latitudinal band as the GRS. This new red spot first appeared earlier this year. The baby red spot gets ever closer to the GRS in this picture sequence until it is caught up in the anticyclonic spin of the GRS. In the final image the baby spot is deformed and pale in color and has been spun to the right (east) of the GRS. These three natural-color Jupiter images.